Discover the wondrous pleasure palace built for King George IV as a seaside escape from his busy life in London. 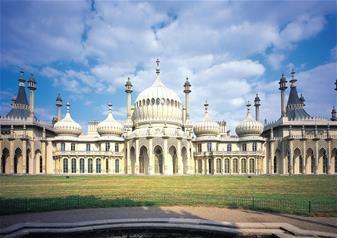 Situated right in the centre of beautiful Brighton, a short walk from the seaside, the Royal Pavilion was also used by King William IV and Queen Victoria during their lifetimes. Designed with the aesthetics of China and India in mind, the inside of the Pavilion is just as breathtaking as the outside. Explore the beauty and majesty of The Banqueting Room, the Prince Regent Gallery, The Great Kitchen, The Saloon, The Music Room and the Royal Bedrooms, as well as wandering through the peaceful and pretty gardens. With so much beauty to see and so much rich history to find our about, this is one of the must-do activities for any trip to Brighton. Audio guides are available in English, French, German, Spanish, Italian, Russian and Mandarin. Disabled access to ground floor only. First floor accessible by staircase. Please note the tea room is located on the first floor. There is an audio-visual room on the ground floor showing a history of the building and the upstairs rooms. On the audio-guides a 'visually descriptive' tour is available (in English only) for blind and partially-sighted visitors. Deaf and hearing-impaired visitors can use the BSL tour. 4/5 Pavilion Buildings, Brighton BN1 1EE.